What a difference 50 years make! Built in Puebla Mexico, the redesigned 2013 Beetle is significantly improved over the previous generation model. We had the opportunity of driving a turbo cabriolet Beetle for a week and found it to be a pleasant surprise all around. 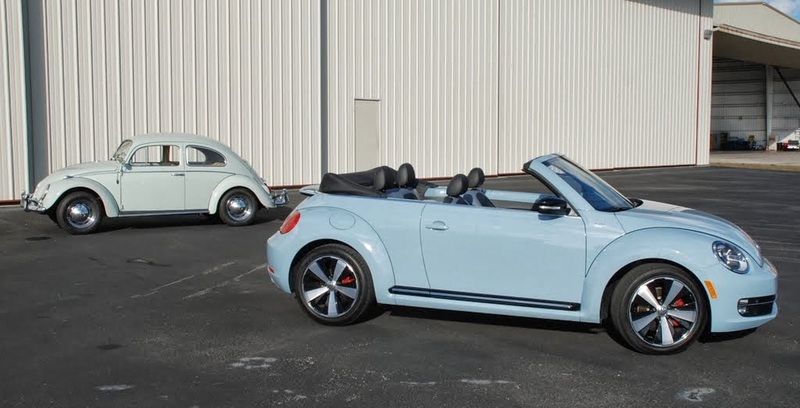 The look of the new model is all Beetle, yet seems less polarizing than before. Yes, I will come out and say it, the previous generation Beetle was a girls car! Ok, there, I said it. 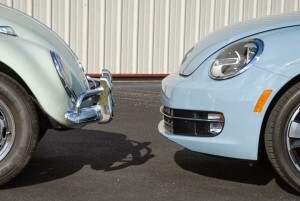 Now, thanks to the subtle, yet important changes that VW did with the redesign, the 2013 Beetle has come of age. 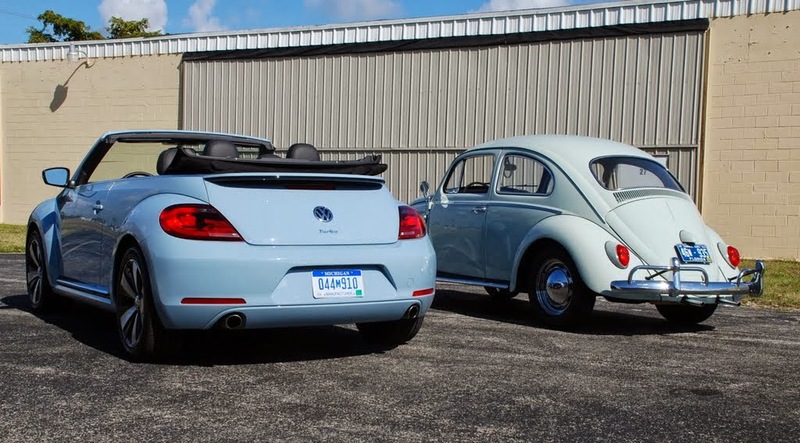 The roof-line is less bubbly, front lamps and rear curves are more cohesive and less busy than before and the look is actually more in tune with the original Beetle design from the 40’s than the generation this one replaces. Oh and yes, the flower vase on the dash is gone. 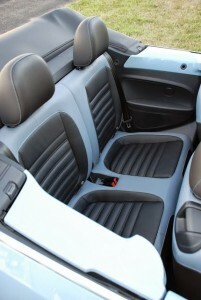 Inside the 2013 Beetle, one is greeted with body color-keyed interior accents on the dash and door trim. There is surprising generous interior space for this size car, with gobs of headroom and plenty of cubby holes and cup holders. 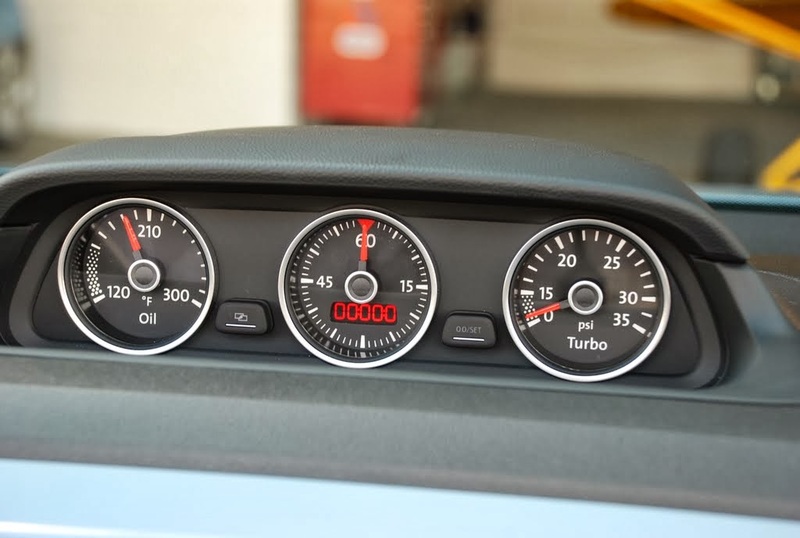 There is a cool-looking instrument cluster in the top-center of the dash that creates a sporty feel for the driver. 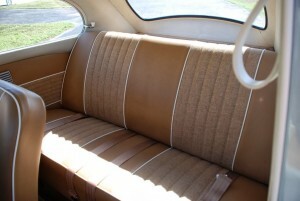 Rear seat is usable but tight, not atypical for this size car. Switchgear and instrument panel is typical VW, which is a good thing. The specific Beetle we tested was one of the Special Edition Beetles celebrating three distinct American cultural history, the 50’s, 60’s, and 70’s. We had the light blue 60’s edition, featuring two-tone seats, de nim blue paint, paying homage to the great invention of blue jeans. These special models come with a $1,200 premium and are available only with the DSG six speed dual clutch automatic transmission. Driving this Beetle felt more engaging and interesting than the previous model. Of course, having a convertible in sunny South Florida always makes driving more entertaining. There are three engines being offered: A Turbo 2 liter, 210 HP, a 2.5 liter 170 HP and wait for it…. A 2 liter, 140 HP Diesel! Yes, a Diesel. There are plenty of trim packages and options available and easy to choose on the car configuration section of the VW web site. The turbo 2 liter was the engine our test car brought and it felt powerful and smooth. Our observed fuel economy was an uninspiring 23.3 MPG over 400+ miles that we drove. Not bad, but not great. 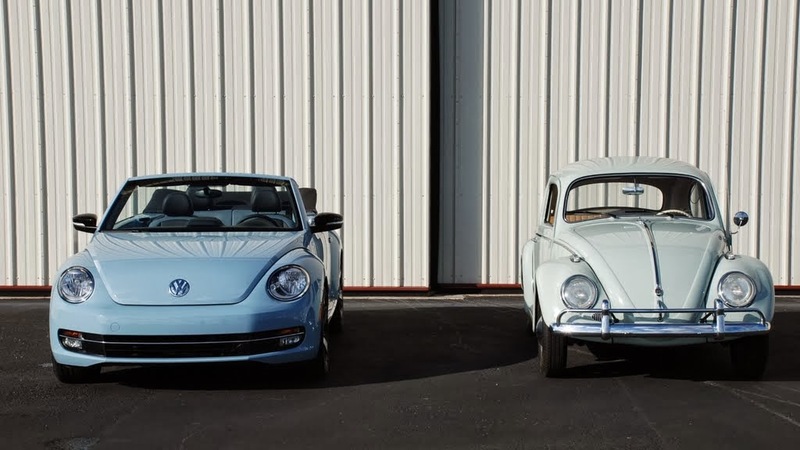 We had the opportunity of comparing side-by-side the 2013 Beetle and a 1963 model that is part of this writer’s car collection. 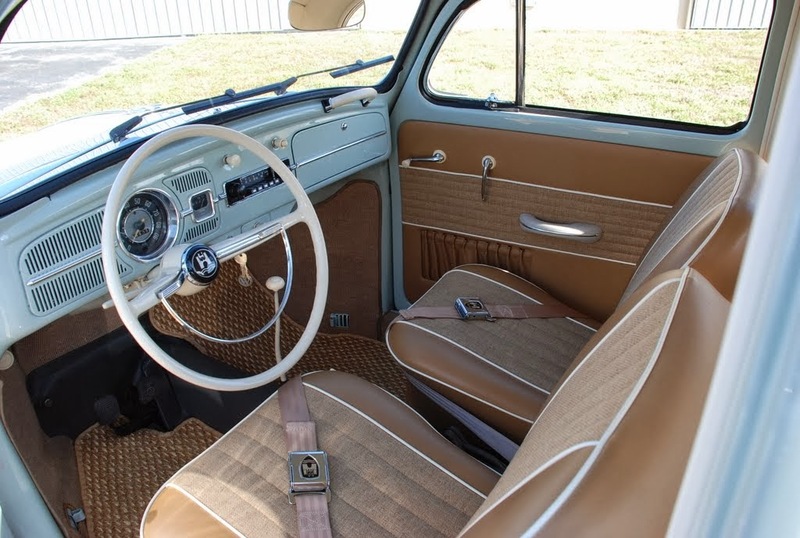 The original Beetle is a perfect example of how well executed simplicity is timeless! From the exterior curves to the basic yet functional interior, this is what revolutionized simple, efficient transportation. There is room for 4 people, with luggage space available in three different places: Behind the rear seats, under the front hood and finally, in the external luggage rack that can be removed in 30 seconds. Power comes from an air cooled 1.2 liter, 40 HP horizontally opposed engine located in the back, which is good for 75 MPH max speed o n a calm wind day. 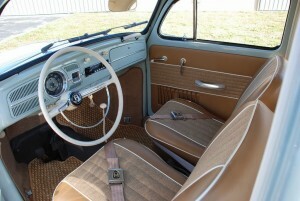 Steering, via a delightfully elegant thin-rimmed white steering wheel is direct, without any power assist. There is an optional radio with one speaker, two speed wipers that you need to time the off function just as they become horizontal on the windshield and ventilation is managed through articulating side glass flaps and rear pop-out side windows. The sound is all VW Beetle, with a hiss and crackle that is unmistakable. Brakes are drums all around, offering leisurely stops. 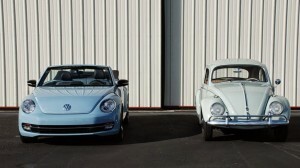 With over six decades under its belt, the Beetle is still a fun, classically designed coupe/convertible that is, like good red wine, getting better with age.